Like a thermostat on a furnace, the governor controls the compressor. 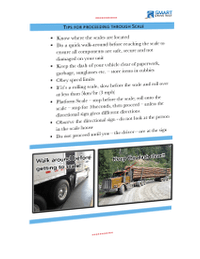 Learn about air brakes here! The only difference between a compressor in a shop or a garage and the compressor on an air brake equipped vehicle is that the compressor runs the entire time the motor is running. So we need some way to control it. The governor is the way that we will control the compressor on an air brake equipped vehicle. The compressor on an air brake equipped vehicle runs the entire time that the motor is running. And because the compressor is capable of pumping up to 500 pounds per square inch, we need some way to control it; otherwise the air that is compressed by that compressor could potentially be dangerous and pose risk to yourself and other people in and around your vehicle. The governor does this by the load and unload phase. And essentially what it does - is kind of like a railway switch, which puts it into a load phase , where it pumps air into the system or puts it into the unload phase where it pumps air into the atmosphere. You you can kinda think of the relationship between the governor of compressor kinda like the bossy wife & the lazy husband! The bossy wife tells the husband to go out and cut the grass. So the compressor goes into the load phase and starts pumping air into the system. When it's done pumping into the system, we’re at the maximum pressure, which in most systems is 135 pounds per square inch. The wife says, “okay, you're all done. You can go in.” And he goes in and sits on the couch watches teli, drink beer and belches. That's the relationship between the governor and the compressor, and think of it like that. Or you can change the sexes too… one or the other. Whatever works? The governor controls the compressor. It puts it into the load phase the unload phase or cut-in cut-out, as it's called in Ontario and other jurisdictions. You can find the video for the compressor here to get more information about the compressor. I’ll put a card up for you there. The other thing about the governor—the other analogy that works really well—is if you think of the governor like a thermostat on a furnace. When the temperature in the house goes down to a minimum, the thermostat turns the furnace on. The temperature goes back up to a maximum - thermostat turns the furnace off. 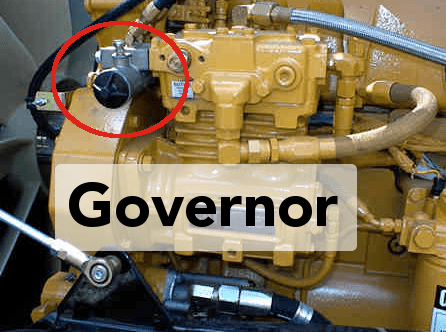 A governor works exactly the same - so the minimum and maximum that the governor works in in an air brake equipped vehicle is 80 pounds per square inch on the minimum, 135 pounds per square inch on the maximum. Now most modern air brake systems work within 20 pounds between maximum and minimum. So therefore if the air brake system works at a maximum of 125 pounds, it’s going to work in a minimum pressure of 105psi. So the governor will return it. The reason we go to 80pse, is so that—you know—all the old-timers who got their 1956 Pete[erbilt truck]; the can still drive them; they will still pass the air brake test because the governor will put the compressor back into the load phase by a minimum of 80 pounds per square inch. 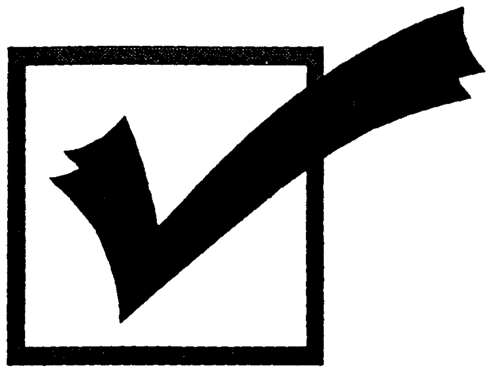 Now as part of your pre-trip inspection for the purposes of a road test and for the purpose of ensuring your vehicle is safe, you have to test the compressor and you have to test the governor. To two tests for the governor are: pump down below 80psi, throttle up a little bit and watch the needles climb. If the needles are climbing, you know that the governor has put the compressor back into the load phase. The way that you know that the governor has put the compressor in the unload phase is that you pump up the maximum pressure. At maximum pressure, the air dryer is going to purge. You’re not going to hear anything else. You're not going to hear the compressor, you're not going to hear the governor. The governor's kind of like Arnie - you know, he was the governor of California. He gonna kill you all silent like! The governor does the same thing; you're not going to hear it— the air dryer. At maximum pressure, the air dryer will purge. It is confirmed by looking at the needles: the needles have stopped climbing. Like a glass of water - when you fill it up and stop putting water in it, the water level stops stops rising. The needles have stopped climbing, therefore, I know that the governor has put the compressor into the unload phase at maximum pressure between 105psi and 135psi in most provinces in Canada. So that's the governor test that you have to do as part of your pre-trip inspection for the purposes of a road test and to ensure your vehicle is safe. In conclusion, the compressor runs the entire time that the motor is running on an air brake equipped vehicle therefore we need some way to control it. We control it with the governor. 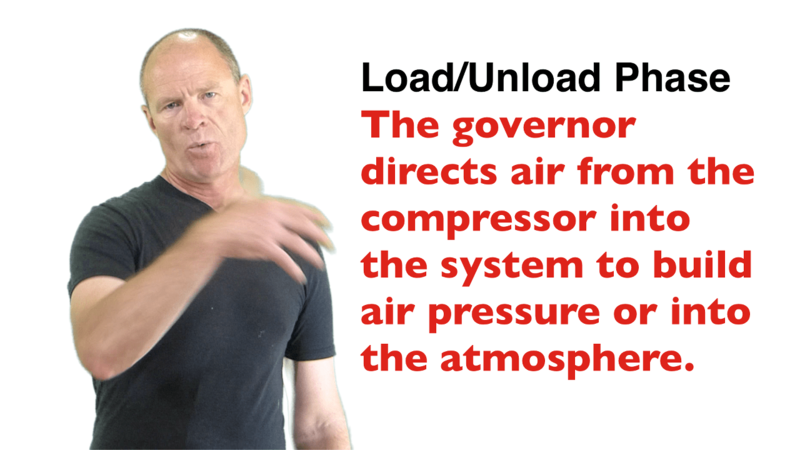 The governor puts the compressor into the load phase where pumps air into the system or the unload phase where it pumps air into the atmosphere. In Ontario and other jurisdictions, they call it the cut-in phase or the cut-out phase. Think of it a little bit like a railway switch, right, it's either on the main track or it's in the side track and when the compressor is in the unload phase it just kind of hangs out, cools off and doesn't really do too much. Until it's put back into the load phase or the cut-in phase and then it pumps air back into the system. Think of the governor like a thermostat on a furnace: when it gets to the minimum, it turns it on, when it gets to maximum, it turns if off. A governor works exactly the same. As part of your pre-trip inspection, you have to test the governor. You have to test the minimum setting, which is it has to return the compressor to the load phase by a minimum of 80 pounds per square inch. And it has to put it in the unload phase at maximum pressure between 105psi and 135psi in British Columbia and other provinces. In Ontario, its between 80psi and 135psi. But most of the time it'll be around 125psi, so you know it's a maximum pressure: the air dryer purges, you look at the needles - the needles have stopped climbing, and the system is between 80 and 135 pounds per square inch in Ontario. That's the test for the governor and the criteria for the governor.